On a hot, muggy summer evening, there is nothing more comfortable than sitting in your recliner with the air conditioner running in the background. Except, there is a problem. Yes, compared to the air outside, the air inside your house feels a little cooler. However, your home’s air also feels just as sticky as the 80% humidity level outside. Even when your AC is working diligently on cooling your house, you may feel as if the indoor humidity continues to rise. Does this sound like your home? If so, the issue can be the result of ac humidity. Here we take a look at six reasons your AC is causing elevated levels of moisture. Although humidity levels will vary due to personal preferences, it is suggested to keep your home’s relative humidity below 50% when outdoor temperatures are above 50°F. Anything higher than 50% creates various issues for you, your family, and home. Too much AC humidity allows microorganisms, including dust mites and mold spores to thrive, potentially leading to family health issues. 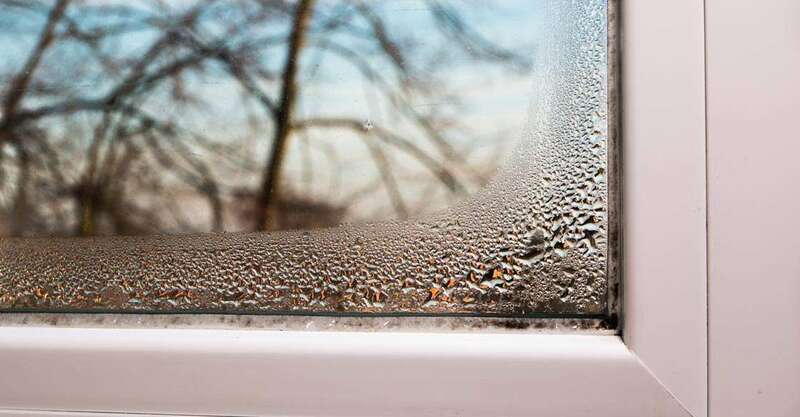 Another problem that will result from high humidity is moisture collecting on windows, doors and even your wood furniture, which over time can result in severe damage. Now that we have discussed the ideal humidity levels for a home let us look at why your ac humidity is higher than you desire. Surveying your equipment could help determine the cause of humidity problem. Is your air conditioner not cooling? If it is not, the potential culprit could be frost on the unit’s evaporator coils, preventing your AC system from functioning correctly. Even if you regularly clean your AC unit, over time, it will require professional cleaning. Sensitive components including the condenser coils are affected by environmental conditions. If dirt, dust or other debris compromise the coils, it will disrupt the refrigerant cycle, leading to higher temperatures and humidity within your home. AC size refers to the cooling capacity, not the physical size of the unit. If you are having issues with high levels of AC humidity in your home, it is possible that you have an oversized system for your cooling needs. It is easy to assume a higher cooling capacity, the better it is to cool your home. Unfortunately, that is not the case. Since an oversized system frequently turns on and off, the system does not run long enough to be effective at controlling both temperature and humidity. Selecting the right size will not only reduce moisture but also cool your home. When it comes to lowering humidity levels, an air conditioner that only has one speed, on or off, will lack the ability to operate efficiently. The unit will run at full capacity until the desired temperature is reached, then turn off until the temperature again reaches the thermostat threshold. If your unit is not running consistently, it will not be capable of reducing humidity. If you are having issues with ac humidity, it could be the result of using the incorrect settings on your thermostat. People often think running the fan setting will rid one’s home of moisture, when in truth it can make humidity levels worse. Although the fan will move air without the AC running, this practice can blow moisture the AC has removed back into your home before it depletes. Your air conditioning unit ages and experiences wear and tear just as do your other appliances. Aging may cause the unit to be inefficient at cooling your home. This is especially true if it has not had regular maintenance over the years. Signs that could indicate the need to buy an HVAC system are inconsistent temperatures, inadequate cooling, and reduced humidity control. Humidity during the hot summer heat is nothing to joke about. Besides risking your health, you expose your home to damage and other issues. If you are currently experiencing high humidity levels in your home, call an expert! They can help get you back to feeling relaxed and comfortable in your home!